"Smokin' Saurian" Dragon Bust Sculpture / Incense Burner | BUDK.com - Knives & Swords At The Lowest Prices! Your favorite incense never smelled so sweet as it does puffed from nostrils of this magical fire breathing dragon sculpture! "Smokin' Saurian," as the beast is affectionately known, is a gorgeous medieval European-style dragon adorned with jagged scales, striking fins, stately horns and menacing scarlet eyes. 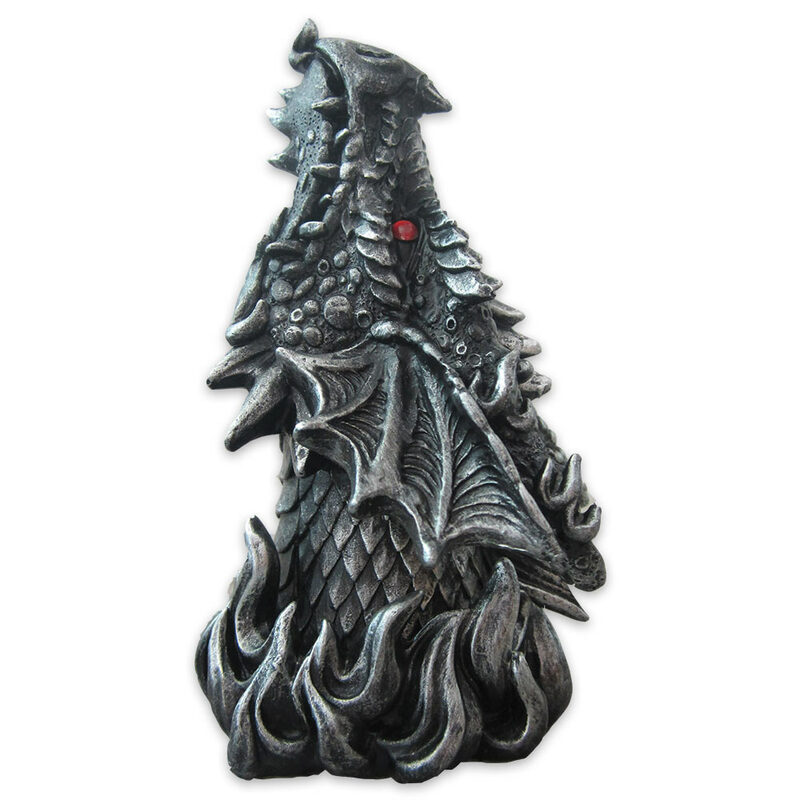 Handcrafted from tough cold cast resin, the aged metallic gray dragon bust rests atop a base ringed by raging sculpted flames. The base provides a perfect heat resistant platform for burning one or more of your favorite incense cones. When the base is wed with the hollow dragon's head, the thick, dreamy incense smoke gently wafts through the saurian creature's nostrils, affording the impression of an irate dragon preparing to exhale turbulent flames - right in your living room, office or wherever you decide to place it! At 6 1/4" high x 3 5/8" wide x 3 3/8" deep, there's really no wrong place to display this stunning work of art. No matter where you place the "Smokin' Saurian," it's sure to be an instant conversation starter. It also makes a terrific gift for fantasy buffs, collectors of medieval or Gothic decor, incense fans or anyone who simply enjoys great art with a lurid sense of adventure!